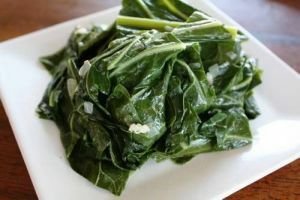 Sauteed Collard Greens is a Portuguese food recipe cooked in beer and garlic. In a large deep skillet, heat the oil over medium-high heat. Add the garlic and cook, stirring, until light golden brown, about 2 minutes. Add the collard greens, beer, and salt and cook, stirring constantly, until wilted and tender, and the beer is slightly reduced, about 15 to 20 minutes.